The Valletta Concours d’Elegance, born out of a collective love of vintage and classic cars and their preservation and enjoyment, seeks to fill in a gap in Malta’s various classic car events by giving local enthusiasts the opportunity to showcase their pride and joy in an upmarket event that celebrates their passion within the majestic setting of Valletta. A team of independent foreign judges with vast experience in similar events abroad has been commissioned to lend professionalism and expertise to the judging process. Various categories of vehicles will be presented and the onus is on the judges to decide on the best entrant in each category, based on a predetermined set of criteria. 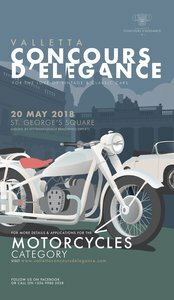 The concours will showcase two Princess Presidential Limousines in the Grandmasters Palace, and for the first time in forty years, these two will be joined with the other two that were initially donated to Malta by the British Government in the sixties. 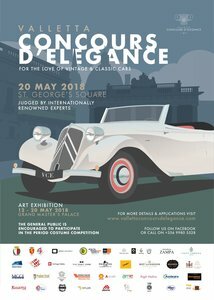 The first two registered cars on the Maltese Islands, with car registration numbers 1 and 2 from 1904, a Siddeley and Cadillac, will also be exhibited in the Grandmasters Palace during a week long art exhibition by twelve Maltese Artists, which will be merged with this Classic Car event. The concours will also exhibit a unique car from Peter Mullin’s 1930s car collection, shipped from California to be exhibited in Pjazza San Ġorġ. The winner of each category will vie for the prestigious overall winners’ trophy. The event is being held in collaboration with the Valletta Local Council and is sponsored by a number of entities, including Valletta 2018. 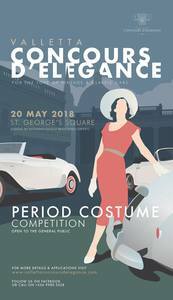 During the concours, on Sunday 20th May, a period costume competition will also be open for the general public. Visit www.vallettaconcoursdelegance.com to find out more.